It was the first watch on the brand, in which the inner beauty became visible. Two new versions of PanoInverse XL differ with a larger case and dial, allowing to fully enjoying the view of a thin dual regulator "swan neck". The novelty is available in two versions: a 42 mm round case made of red gold (Ref. / 66-02-25-25-05 /) and stainless steel (Ref. / 66-06-04-22-05 /). The incomparable beauty of the PanoInverse XL watch is visible at a glance. The beauty is created by gold chatons, which are fastened with three white screws to the three-quarter platу with the company's ribbed surface finish, as well as applied Arabic numerals and elegant power reserve indicator. Double thin controller "swan neck" is made of galvanized silver and mounted on the bridge of the balance, on which is applied white galvanic engraving. Steady oscillations of the screwed balance are the original scene that conveys the beauty of watch heartbeat hours - of the manufacturing movement. Design of the PanoInverse XL watch is great, thanks to a double fine regulator, located on the dial at the "3", "4" and "5" o’clock positions. The excellent performance of the controller makes it possible to admire the aesthetic perfection of the element providing the finest adjustment of the mechanism. The beauty of this thin component, which is sometimes called "butterfly”, has inspired the masters of Glashütte Original to transform the construction of the mechanism so as to make a "butterfly" on the dial. This design allows the inner beauty to make available. The mechanism, which had been visible only from the back side of the case through the transparent case back, and is now visible from the front side of the housing. To implement this idea, it took the creation of several new components and modifications of existing parts. 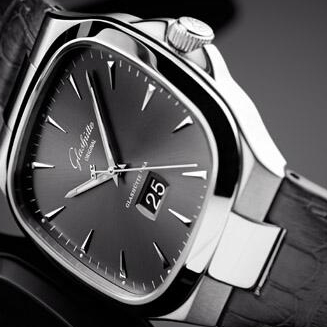 The hours and minutes indication is carried out on a small dial located on the left side. Beneath it is located a small window with a second hand. Delivered The PanoInverse XL watch is delivered on leather straps: a model with a gold case has a brown alligator strap, and the model with a steel case – a strap of nubuck or a gray stainless steel bracelet. The models equipped with a caliber of 66-05 and 66-06 on the 31 jewels, with a frequency of 28,800 vibrations per hour, power reserve of 41 hours. The model with a gold case is released in a limited edition - 200 items.